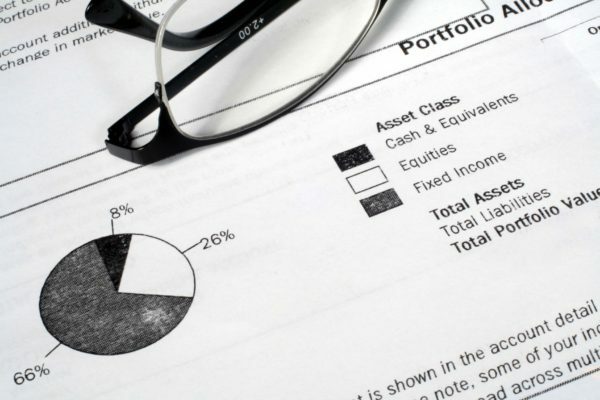 Home » College Students » Tools & Resources » What is a 401k? According to Vanguard, the median account balance of 401k accounts is $26,405. Nobody wants to spend their golden years living off of $26,405 and social security checks. Read on to learn more about the most popular retirement option once you’ve landed that full-time job: the 401k. Most experts say that retirees should have saved roughly 80% of their annual income to live off of per year for their 15-20 year retirement lifespan. So for example, if you made $100k each year, you would want to save $80k per year of retirement, or $1.2m to $1.6m. The median 401k balance of $26,405 clearly falls far from this mark. This chart below with data provided by Vanguard further proves this point, that some people are saving a large amount of money, but that the vast majority are saving much less than they should. How do people start the retirement process? There is no singular retirement option that will work for every person, but the most popular retirement option is a 401k plan, and you can start saving as soon as you begin your first job. Put simply, a 401k plan is an option to defer part of your income and have it placed in an account to access at a later date. These funds will grow with interest over time, since they are usually invested by a third party management company to grow your retirement fund. Typically, companies will match a portion of the salary you have contributed, on average 3% of your total salary. Another key benefit – the money in your 401k account will usually not be taxed until it is withdrawn, either for emergencies or upon retirement age. Matching contributions by employers are a significant factor in employee participation, as it is also the primary vehicle for employers to distribute company stock to employees. 43% of employees claim that the contributions made by their employers were the primary factor in choosing to participate in the 401k program. 88% of employees participate in their employer’s 401k program. Roth 401k plans are similar to traditional 401k plans, with one significant difference. As opposed to paying taxes on money as it’s withdrawn in a traditional plan, a Roth 401k taxes the money as it’s deposited. There are pros and cons to each plan (see below) but a Roth plan will give a better indication of how much usable income is really in your retirement plan, since it’s already been taxed. According to Vanguard, 56% of companies with retirement plans offer Roth 401ks, so they aren’t as popular as traditional 401ks. Vanguard further claims that only 14% of those employees use Roth 401k plans, though that’s a relatively large jump from just 9% in 2010. Nobody has all of the answers, but here are a few guidelines to keep in mind when choosing the right 401k plan for you. Flexibility: The Roth 401k plan is more flexible than normal 401k plans. Should an emergency arise, you can withdraw from a Roth account without fees so long as you don’t exceed your original deposit and keep the money that has grown by interest in the account. Regular 401k plans tax money upon withdrawal, and an additional 10% fee for withdrawing before age 59 and a half. Deposits: Both accounts limit deposits to $18,000 a year (or $24,000 if you’re 50+). Keep in mind that Roth accounts are taxed at deposit, not withdrawal. A taxed $18,000 goes further than $18,000 waiting to be taxed. Taxes: Taxes can work in favor of either plan. As an example, if taxes are very high now but lower in the future, it’s better to go for a traditional 401k and pay the taxes later when they’re lower. Experts recommend younger workers to use Roth 401ks when possible to enjoy years of tax free growth. Employer Matches: Employers typically match the amount that their employee deposits, but keep in mind you pay more money up front with Roth accounts. It may be difficult to put aside $18,000 (after tax) to get the full benefit of your employer’s’ matching contributions. However, not all companies provide 401k plans or other retirement options for their employees. Plans will vary by industry. 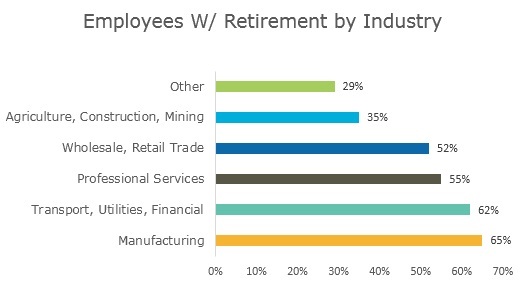 According to a chart curated by Bloomberg, manufacturing is the industry most likely to provide retirement benefits, with ~65% of employees covered. As we’re seeing in our emerging world of startups, more can be done with fewer people. 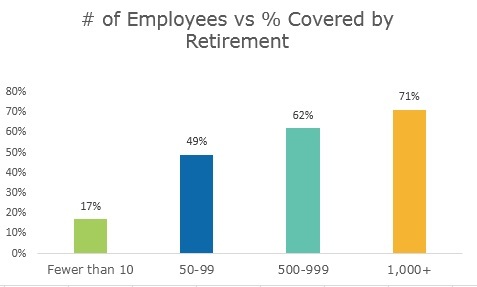 This isn’t all good news though, as less than 20% of companies with 10 or fewer employees provide retirement plans, and this percentage only jumps to 50% of companies for companies with fewer than 100 employees. How can you start saving for retirement? The most common option for those without a 401k plan is an IRA, or individual retirement account. The limit for contributions for an IRA is $5,500 a year for those under 50, or $6,500 for those 50+, so – as with any retirement plan – it’s better to start early and be consistent with saving. Read more about IRAs here. Want to learn more about how top industries stack up in terms of other benefits? Check out our industry guides on Marketing, Consulting, and Finance. You know what else is good for retirement? Getting a good job. TransparentCareer offers free data on careers, compensation, and salary negotiation. Maximize your 401k by getting paid what you’re worth! Sign up here.